Bucks County Audubon Society - Times Publishing Newspapers, Inc. Since 1969, Bucks County Audubon Society has been dedicated to educating people about the natural world and inspiring them to take positive actions for the earth. *Citizen Science Projects – Supporting scientists who are working to create solutions to climate change and other environmental issues. In 2019 Bucks Audubon is celebrating its 50th Anniversary, with a focus on inspiring everyone to take eco-friendly action for the Earth. Bucks Audubon will host events throughout the year in celebration of the 50th Anniversary with hopes of encouraging others on their path towards happy and healthy environmental actions. Join Bucks Audubon’s celebration and be inspired! *50 Week Eco Challenge – Check out their social media and website to participate in a weekly challenge designed to build upon your relationship with the natural world around you and get you ready to reduce your carbon footprint. *Earth Day Festival, April 13th, 10:00am to 3:00pm – What better way to celebrate your love of nature and to get hands-on with the environment as a family than to celebrate Earth Day with Bucks Audubon? *Solar House Tour, May 4th, 10:00am to 3:00pm – Get inspired to use renewable energy by joining Bucks Audubon on a tour of local homes powered by the sun. Interested in participating in one of their many events or learning more about the BCAS’s great plans for 2019? Visit their website at www.BCAS.org today! 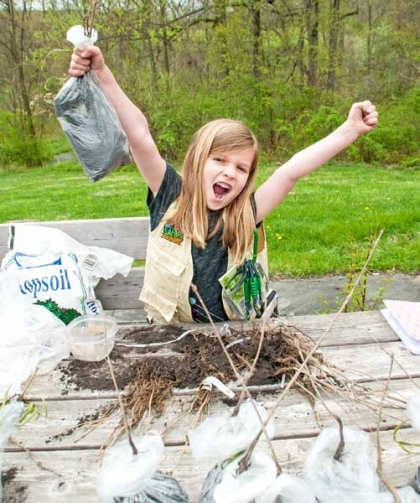 PHOTO CAP: Bucks Audubon inspires people of all ages to engage in actions that help the earth! Clare Sheehan gets excited about planting trees during the BCAS Earth Day Festival.